The Rocketdyne Cleanup Coalition was pleased with NASA’s recent announcement that it will fully comply with the Agreement on Consent (AOC) signed in December 2010 to cleanup it’s portion of SSFL to background levels and that it will modify the proposed scope of its Environmental Impact Statement to be in compliance with the AOC. Congressman Brad Sherman, Assemblymember Julia Brownley, Ventura County Supervisor Linda Parks, and LA City Councilman Greig Smith held a press conference at SSFL to deliver a letter to Boeing to call on it to stop frustrating the cleanup and join in the agreements-in-principle reached with DOE, NASA, and the state. DTSC Announces Historic Cleanup Agreements! 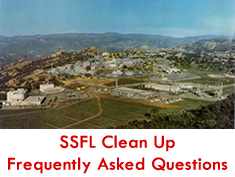 On September 3, in a tremendous victory for community members, breakthrough Agreements-in-Principle (AIPs) were announced between the California Department of Toxic Substances Control (DTSC), the U.S. Department of Energy (DOE), and the National Aeronautics and Space Administration (NASA) for the cleanup of the Santa Susana Field Laboratory (SSFL).